Can the beleaguered investor turn things around? Bill Ackman earlier this month escalated his campaign to install three dissident directors onto Automatic Data Processing Inc.'s (ADP - Get Report) board with a 167-page presentation and a three-hour-plus call with analysts and investors arguing that the payroll and human resource management company should cut staff, integrate operations and focus more on innovation and technology. The market was either not impressed with Ackman or was discouraged by ADP's response, which was to reject everything the insurgent investor urged it to do. ADP's shares opened that day at $110.69 and closed at $104.68. Target company shares typically spike when a well-known successful activist launches a public campaign. On Aug. 4, the day Ackman was forced to take his insurgency public, the share price dropped to $111.39 a share, though the price was up slightly from $103 a share in late July prior to the first reports that a campaign was in the works. So far, Ackman's cost basis is roughly around ADP's trading price of $104.73 a share. "Someone clearly did a lot of work on the company but it didn't seem like they had distilled things into an easy to grasp campaign," said Thomas Ball, managing director at proxy solicitor Morrow Sodali. "Pershing Square seemed to be saying that ADP should be more nimble. I didn't come away from that feeling like they had a focused campaign that was easy to grasp. I don't think people will want to spend the time doing the analysis, they rather would have something that is more easily digested." The tepid share price performance so far is just the latest in yet another tough year - so far - for Ackman and his fund, Pershing Square Capital Management LP, which has faced major setbacks with investments and campaigns in Chipotle Mexican Grill Inc. (CMG - Get Report) , Herbalife Ltd. (HLF - Get Report) at the same time that ADP is battling him hard. The payroll and human resource management company came out swinging, pointing out that its performance is about seven times greater that Ackman's during its CEO's tenure. 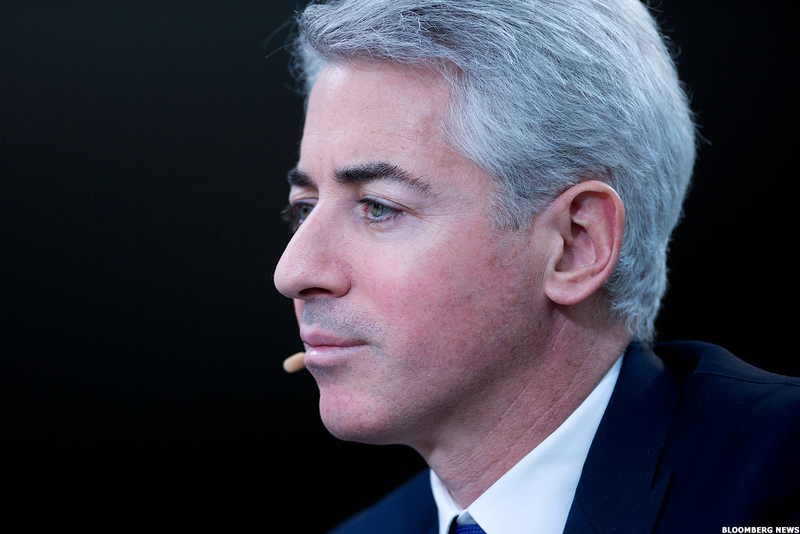 Ackman, for his part, could respond that his fund has had returns of over 500% over the life of his Pershing Square fund, from 2004 through December, according to a recent presentation. That's well above ADP's returns over that time period. Morrow Sodali's Ball said he would feel comfortable defending ADP against Ackman because of the activist manager's blunders and poor performance in recent years. As a result, he doesn't believe that the payroll and human resource management company will feel compelled to reach a settlement with Pershing Square that puts Ackman on its board. "It certainly looks like it's shaping up to be a bad year [For Ackman]," Ball said. "Pershing Square's performance and the missteps are all things that would make [ADP's] PR firm and proxy solicitation firm believe that they have a very good hand to play." Consider that most well-known activists don't have other well-known insurgent managers coming out publicly against their thesis. However, Ackman now has had two public opponents against his campaigns. Billionaire raider-turned-activist Carl Icahn came out against Ackman's $1 billion short position insurgency at Herbalife. Icahn got five directors on the company's board and disputed Ackman's assertions that the nutritional supplements distributor was a Ponzi scheme. Bill Ackman has had a rough year. Most recently, Herbalife reportedly held talks to go private. No deal emerged. Had one been consummated it would have been another major blow to Ackman who hopes Herbalife will one day trade much lower or perhaps even zero dollars a share. The failure to strike a deal could also be interpreted as a win for Ackman, as it may suggest a sale may never happen. And at ADP, Ackman now faces Robert Chapman, a former prolific activist fund manager who was one of the early employers of the "poison pen" letter to CEOs. Chapman came out battling with a short-selling ADP campaign he described on CNBC TV the same day Ackman revealed his 167-page presentation for change. Ackman has some other big bets, too. Most importantly, Ackman has lost billions of dollars doubling down his support of embattled drug company Valeant Pharmaceuticals (VRX in recent years (not an activist campaign) as its shares dropped precipitously from a high of $262 a share in 2015 to trade at roughly $11 a share in March around when Pershing Square liquidated its position. Overall, Ackman had an abysmal loss of 20.5% net of fees for 2015 and a loss of 12.1% after fees for 2016. In 2017, partly due to a Trump administration bump in some stocks, Ackman appears to have recovered slightly though his fund's year-to-date return for 2017 as of Aug. 22 is still -5.8%. But over the long term, Pershing Square has had an impressive returns of 15% net of fees since its inception in January 2004. Another major misstep this year appears to be Pershing's investment in restaurant chain Chipotle, at least so far. The investment was a win from an activist perspective in that Ackman settled in December with the company to add four new directors to its board. The restaurant chain also ended its costly co-CEO arrangement after co-CEO Monty Moran left, another success for Ackman. Nevertheless, things have deteriorated of late, perhaps reaching rock bottom earlier this month after a customer at a Dallas-area restaurant posted a video of rodents inside the location. Shortly before that, in July, 135 customers got sick after eating at a Sterling, Va., Chipotle, which tested positive for norovirus, likely spread by a Chipotle employee. The company is also still trying to repair its image after its E. coli outbreak at restaurants in 14 states in 2015. It's recent share price of $308 a share also is well below Ackman's investment cost basis of about $404 or $405 a share. Pershing Square acquired an initial 9.9% stake last year. Historically, Ackman has had some big wins and also a number of big losses. The fund liquidated its Canadian Pacific Railway position last year at a significant profit - about $2.6 billion in gains --- after he engineered a breathtaking board takeover at the railroad company in 2012. His investment in Restaurant Brands International, (QSR - Get Report) , owner of Tim Hortons and Burger King, has done well and he was the driving force behind the sale of Allergan to Actavis in 2015, also big win for the fund. Other wins include his investment in Air Products and Chemicals (APD - Get Report) , Howard Hughes Corp. (HHC - Get Report) and Nomad Foods Ltd. (NOMD - Get Report) , where Pershing Square partner Brian Welch holds a board seat. In addition to Ackman, Corvex Management's Keith Meister and Elliott Management's Paul Singer own shares in Nomad Food as well, which suggests that another activist campaign could be cooking there. However, there also have been high profile losses as well. In 2013, Ackman sold his large stake in J.C. Penney Co. (JCP - Get Report) after quitting the board in the wake of disagreements about the company's management. In 2011, Ackman gave up in his efforts at Target Corp. (TGT - Get Report) after shareholders rejected his bid to install five directors onto the company's board. Nevertheless, not everyone has given up on Ackman yet. Bruce Goldfarb, founder of proxy solicitor Okapi Partners, said he would not count out Ackman as a first tier investor. "Pershing Square may have a comeback on the near horizon," he said. "Activism is a challenging investment strategy and the playing field has changed dramatically in the past few years. Activists still have to identify situations where value can be created and then provide companies with the tools to execute a value creation strategy." Consider that Ackman's ADP campaign is in an early stage. It's possible that the company is only employing a scorched earth response as it seeks to keep arbitrageurs and other activist investors from joining Ackman in the stock prior to Sept. 8, the record date by which one has to hold shares for them to be eligible to vote in the upcoming annual meeting and proxy contest. See if ADP becomes more amendable to Ackman's ideas after that date has passed. Editor's note: This article was originally published by The Deal, a sister publication of TheStreet that offers sophisticated insight and analysis on all types of deals, from inception to integration. Click here for a free trial.